I was looking through my old Geminid meteor shower posts and saw a fuzzy blob in the sky. 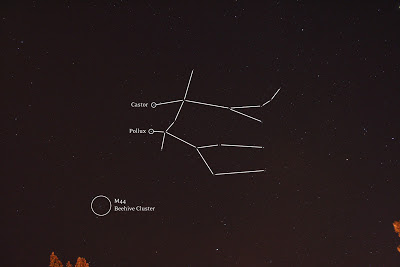 I looked it up, and turns out it's a Messier object (M44) known as the Beehive Cluster. Who knew! Aside from the ones I've already photographed, I'm still unfamiliar with the location of Messier objects in the sky. Since I don't have a scope, I only have access to the brightest deep sky objects. The Beehive Cluster is down and to the left of Gemini, which makes it fairly easy to find (that is, if you know to look for it in the first place). This makes a total of five Messier objects that I've photographed so far. I suppose I should start a checklist! I'm making a note to revisit M44 on the next clear night. Last night I spent some time on the open cluster in Canis Major (M41) that I'm still processing. That will take my new total up to six!